Founded in 1935, the Stokes Retail Group has over 140 locations across the country and is Canada’s only national chain for kitchenware, tableware and giftware stores. We search the world to bring fashionable, practical and quality merchandise at great prices. We are located coast to coast in all 10 provinces and their major cities with our Stokes and ThinkKitchen™ Stores. Our Stokes Gift Cards are also redeemable at ThinkKitchen™ Stores. 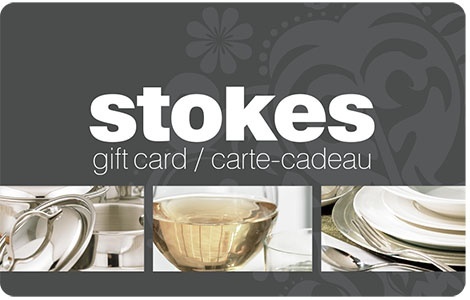 Order your bulk Stokes gift cards from National Gift Card Canada today! This gift card is redeemable for merchandise only, at any STOKES location in Canada. It is not redeemable for cash, except where prohibited by law. Purchases will be deducted from the gift card, until the value reaches zero. STOKES is not responsible for lost, stolen or unauthorized use of this card. The check your balance, visit any STOKES location. Treat this card like cash. Also valid in all Thinkkitchen stores.